With the flooding upon us, one might wonder what are the effects of the flooding on our tree health. One might think lots of water is good for trees but you know the saying too much of a good thing can be bad. 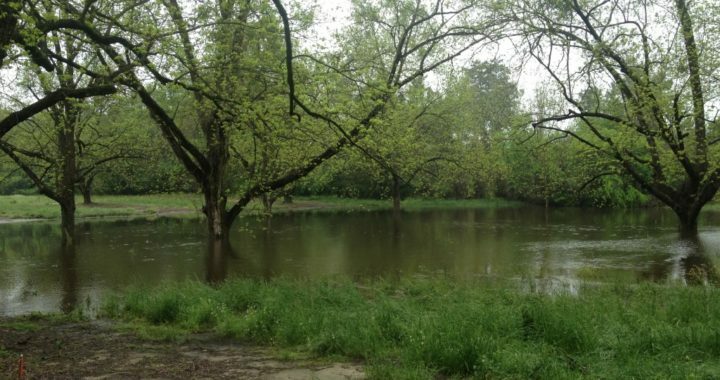 Flooding presents a few issues to trees. It can leave the tree vulnerable to secondary pest, suffocate the tree, and loosen up the root foundation. The soil has space in between each soil particle. For example picture sand versus rocks, the rocks have more space between each other than sand particles do. And likewise, it is the same with soil. The spaces or pores contain air or oxygen pockets where the tree roots get their oxygen. When the soil becomes flooded, these pores fill up with water and the roots can’t get any oxygen. Oxygen deprivement can cause stress, stunt growth, injury and/or death of the tree. Several factors like the tree’s natural flood tolerance ability, soil drainage, and soil pore quality ( more porous vs less porous soils) can affect the tree’s survival ability. What you may want to consider when planting a new tree is the tree’s flood tolerance, soil, and location (up-slope as opposed to down-slope). Flooding can also cause the soil to loosen up and wash away causing the tree’s root foundation to become structurally unstable. A weak root foundation can be very dangerous with high winds. We recommend having a tree care professional come and inspect the structural quality of your tree during this flood season. Having a 50-100 foot tree fall on your house can cause expensive structural damage to your home not to mention the injury this could inflict on your family or pets. After the flooding has dried up, there are still dangers to your tree called Secondary Pest. “Flooding, drought, and premature defoliation impair tree defense mechanisms and trigger biochemical responses that release carbohydrates, sugars, and other nutrients which seem to invite insect and fungal pathogen attack,” According to an article in University of Florida’s Hillsborough County scholarly journal. Fungus and insects can attack your tree after the floods. Some culprits include water mold, ambrosia beetles and bark beetles. Contacting a tree professional can help determine if your tree is infected with any of the aforementioned. If your tree exhibits any of the following symptoms, yellowing of the leaf, leaf thinning, and stunted leaf and tree growth. 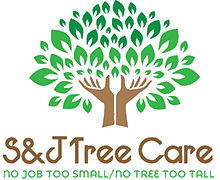 Please contact S & J Treecare to help diagnose and treat your tree. Do you notice any funky-looking growths on your trees? One of the signs you have a diseased tree, for instance, is the appearance of fungi– which can be colorful growths, looking like a mushroom, conk or shelf-life structure. 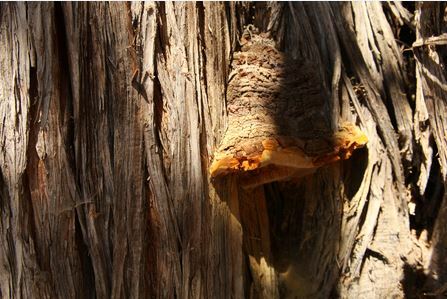 Fungi typically appear after a tree has been wounded. How does that happen? Well, say you’re cutting the lawn and you accidentally swipe the base of the tree with a part of your lawn mower. You think nothing of it, but now that tree has a flesh wound. Or maybe you take your pruning shears to some tree branches… and when you’re done, there are parts of the “inner” parts of the branches left exposed to the elements. Their protective covering has been pruned away, whether on purpose or accidentally. Hey, it happens. Other ways trees get wounded include excavators (coming along to carve out areas for sidewalks, for instance), trench builders (putting in or taking out water/gas lines), and even good ol’ wind damage thanks to Mother Nature. Fungi are looking for a place to grow, and tree wounds are ideal. Therefore, a fungus will enter a wound and start to discolor it. Essentially, fungi cause wood to decay. Wood fibers get weakened. In many cases, roots get weakened, too, causing structural support problems for the tree– and it begins to look like it’s going to fall. Perhaps the tree begins to take on an asymmetrical shape. If you start to notice you’ve got large limbs that look like they’re dying and, indeed, they start to fall off the tree at the slightest hint of wind, you probably have a diseased tree. Once a tree gets diseased it’s very hard to turn it around and make it completely healthy again– some might say it’s impossible. Over time, the tree may decay to the point where it becomes a danger to people and property around it. In that case, it’s time to call S & J Tree Care to come take it down and remove it safely and properly. Informational sites, such as drought.unl.edu, can be helpful to tree care providers. Image courtesy of drought.unl.edu. As humans, we seem to struggle with things that we have no control over. Bullies at your kids’ school, the driver of the car in front of you on the highway and prices at the grocery store are everyday examples. The weather is another. The common sense approach to dealing with any of these circumstances is the same. First, it’s about acceptance. Take a deep breath, accept it, and then examine the options and management strategies going forward. Many regions throughout the U.S. have been in soil water deficit patterns the past few years. While this is not a surprise to tree care providers in those locations, arborists in other areas can benefit by being aware of the drought condition of the country as a whole. One of the best sources of this information is the National Drought Mitigation Center website, coordinated cooperatively by several agencies. As you peruse this site, be sure to click on the Drought Monitor icon to investigate current conditions; this helpful tool is updated on a regular basis throughout the year. Trees on a slope suffer because runoff occurs before adequate infiltration takes place. Photos courtesy of John Fech. Regardless of how wet or dry it has been in various locales, some landscape features and microclimates are simply better than others in terms of water efficiency. Slopes — In terms of dealing with drought, slopes are horrible. The main issue is that there’s no way to retain the water before it runs off. When rain occurs as a gradual light precipitation event, the effects are reduced, but they still occur. Clay soils add insult to injury in that they offer much reduced opportunity for infiltration at the top of the slope. Slopes that are hard to mow are good indicators where this will occur, but even gradual slopes will be subject to uneven infiltration if trees are growing in clay soils. Thin narrow strips in the landscape — Usually covered with concrete or another impervious surface, trees in these locations rarely gain the full effect of natural rainfall events. Considering that less than a quarter of the potential roots are below soil or a modified soil, it’s no wonder they often struggle. In a similar problematic way, flat expanses of asphalt and concrete materials that surround a tree and cover the roots are also frequently encountered in both residential and commercial sites. In addition to being restrictive for water percolation, the covering also cuts off oxygen exchange. Low-maintenance areas of the landscape — Various out-of-the-way locations, such as alleys, rural cemeteries, parks, golf course roughs, museums and school grounds, can be droughty sites for several reasons. Many of these areas contain buried debris, pea gravel, perched water tables and compacted soils, which limit infiltration and tree root expansion. Turf and trees differ greatly in the amount of water they need, with trees requiring about one-third (on average) of what is necessary for turf. If placed together in the landscape, problems arise. Two main outcomes can occur if they are co-located. Good mulching practices are important when dealing with drought. When water is applied with the goal of keeping turf green and healthy, the result is that the rootzone stays moist to soggy for the benefit of the turf and the trees tend to be overwatered, with water filling the spaces between soil particles for long periods of time. Likewise, when water is applied to meet the needs of the trees, the turf may suffer. A best management practice concerning trees and turf is that they should be separated in the landscape and cared for as separate masses of plant materials. Whenever possible, work with landscape designers and architects to encourage their division. Efforts to keep the root systems of young trees moist (not soggy or dry) are more important than efforts aimed at older trees, at least in the short term. Younger trees have smaller root systems and have less capacity to recover from periodic droughts than older trees with extensive and expansive roots. As such, in terms of prioritization, if several weeks go by without a significant rainfall event, focus your initial efforts on providing supplemental irrigation for young or newly planted trees. In order to determine the moisture content of trees (or turf for that matter), insert a deep probe into the root profile, pull it out carefully and slowly and feel the tip end. If it goes into the soil easily and a slight sloshing sound is made, then the soil is too wet. If the soil is dry and powdery, then it’s too dry. If it feels cool and moist, then, like Goldilocks with the Three Bears, it’s just right. Whether trees are young or old, the goal is to deliver water to the bottom of the roots and keep them moist. It takes some experimentation at first to know how deeply various trees are rooted, but starting with the mindset that the majority of feeder roots are in the upper 24 to 30 inches of the soil profile is helpful in terms of overall rooting depth. When problems are encountered, excavation exercises can help you gain insights during the diagnosis. There’s more than one way to bake a cake, and the same can be said for watering a tree in a drought. Slow trickle – Probably my favorite. With a drip irrigation system, soaker hose or a hose laid on the ground, the slow and gradual emitting of water limits evaporation and facilitation of infiltration, which is beneficial for clay or compacted soils. 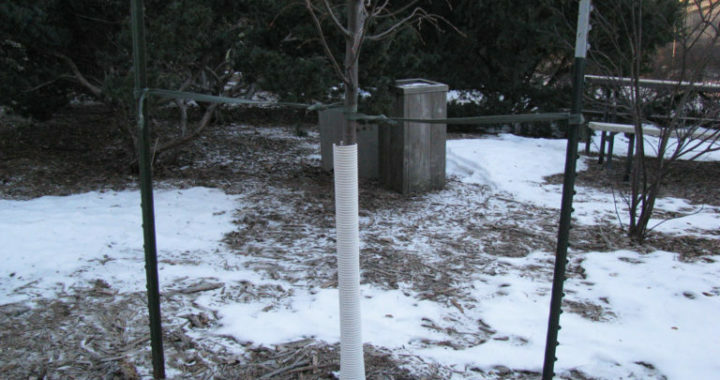 Water bladders – Especially good for young trees, placing 15 to 20 gallons of water near the base of the tree to be absorbed slowly can be quite effective. These work well, however, the need to refill these can be a limiting factor to their success. Delayed starts – On slopes and in narrow strips, adjusting a time clock controller to run a particular zone for a short time (10 minutes or so), then stopping to allow the applied water to percolate downward, and then start again after a couple of hours to finish the job is a good way to overcome the natural tendency for water to run off before it infiltrates. Overhead – From an efficiency and uniformity standpoint, overhead irrigation is generally not considered a good method. However, it’s easy to see where the water is going, and easy to measure how much is being received. Overhead irrigation replicates Mother Nature to some degree as well. Water lance – Attached to a water tank or spigot, a slender pipe with a hole in the end can be effective because it limits evaporation; however, it can create excessive water channels or chasms underground. In addition, there’s the potential to push valuable water past the rootzone. When using a water lance, push it into the soil about 6 to 12 inches deep and use low water pressure. After a rainfall, it’s desirable to hold on to the water and not let it evaporate. Proper mulch installation begins about 3 inches away from the trunk and extends to the drip line of the tree (or as far away as your client will allow). Obviously, several options exist, but the best advice on depth, type and placement comes from Mother Nature. She uses natural mulch, not rock or rubber; she allows it to accumulate to about 3 inches in depth before decomposing and recycling nutrients back to the roots; and she uses a variety of materials including bark, leaves, fruits, flowers and stems. As you communicate with your customers about mulch product options, point out a few well-mulched landscapes, either naturally placed or replicated by an arborist. A few terms are helpful to consider: Weather is what we experience day to day and week to week. A forecast is what we expect, or are told to expect. Climate is an accumulation of weather events over a long period of time. In a sense, weather can be a good answer for the unknown or the hard to determine, as it is such a major influence. There’s nothing like it terms of impact. After all, it’s multi-component factor with winds, flood, hail, heat, drought, sun, rain, snow and ice. It’s an all-season and ever-present factor. There is no rest from the weather; it’s dramatic – extremes seemingly are commonplace these days — and, it’s a mimic because weather related maladies are often difficult to diagnose because they closely resemble insect or disease related injury causes. Weather is often defined in black and white terms of good or bad, at least from the human perspective — but what’s good weather for a tree? Perhaps it’s best to describe it in two ways, in the establishment phase and the maturity phase, or even year one and year two and beyond. Initially, even if a tree is touted to withstand soggy or dry soils such as a baldcypress or a chinkapin oak, most trees tend to be favored by moist, not soggy or dry soils, moderate temperatures and moderate winds. Sure, eventually drought tolerant species will be able to survive well on limited water, but at first, moist soils, favor the development of roots and shoots. Likewise, exposure to gentle to moderate winds encourage a tree to respond by developing a strong structural root system and bole to resist wind throw. After establishment, good weather conditions are those where most days are in the desired range for the species in terms of moisture, wind and sun. Conversely to the above, bad weather conditions are those that present a tree with significant time outside of the desired range for a given species. An important caveat to the good and the bad is the ugly, which is the time lag or the length of time that it takes for symptoms of injury that are due to weather to express themselves. For herbaceous plants such as tulips, turfgrass or hostas, there is a short time involved with the visibility of a cause and effect of weather ie. it’s hot and dry for 4 weeks, without supplemental irrigation, Kentucky bluegrass is going to wilt in the heat and appear highly stressed. With established woody plants, the symptoms often show up several months later or even the next year in response to the same heat and drought. Most customers simply cannot fathom this difference in responses to weather; therefore it’s wise to try to explain or at least warn them in advance of what could come to pass. Drought injury and leaf scorch — Caused by extended periods without adequate rainfall or supplemental irrigation. Prevent it by providing even moisture, mulching to retain moisture once received, monitoring often with a soil probe/screwdriver to gauge moisture content. 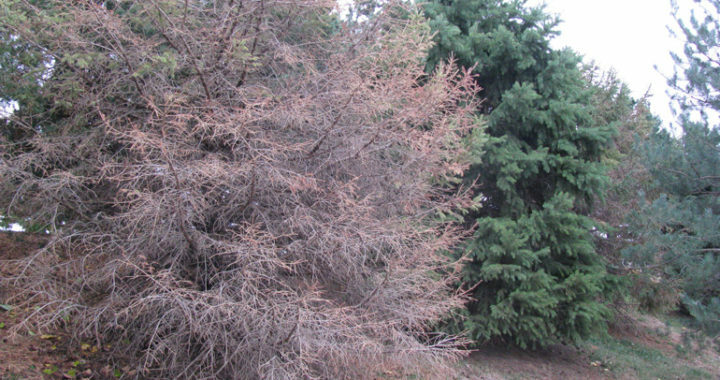 Winter desiccation — Caused by strong, consistent winds that dry out leaves; worst on broadleaf evergreen species such as holly and arborvitae. Prevent it by irrigating to moisten soil and enter the winter with roots fully hydrated, apply an anti-desiccant product 3-4 times as per label instructions, install wind screens in high value situations. Sunscald — Caused by solar rays that warm the surface of thin barked trees in winter, causing it to be warm and cold in a series of diurnal cycles. Prevent it by installing white wrapping or PVC drain tile to reflect solar rays in late fall, remove in late winter. Hail Damage — Caused by ice chunks striking the bark with sufficient force to break the surface and allow desiccation and entry of pathogens. Correct it by pruning out badly affected branches. Wind Encouraged Herbicide Drift — Caused by movement of broadleaf herbicides from adjacent areas. Prevent and correct it by discussing potential for damage with nearby property owners. Provide for future needs of tree but avoid overwatering and overfertilizing. Frost Injury – caused by cold temperatures received after buds have broken dormancy. Prevent or correct it by avoid species that are prone to frost injury. Prune out badly affected branches. Wet Soils – caused by overabundant moisture from flood, irrigation system leaks and zealous turfgrass irrigators. Prevent or correct it by measuring rainfall and irrigation amounts received and adjusting accordingly. When wildfires roll through, the devastation is often immense. While attention is usually focused on the impact to structures — sometimes homes are burned right down to their foundations — part of the rebuilding process requires an evaluation of the surrounding trees. In most cases, a decision can be made relatively quickly about whether a building is a total loss and must be replaced, or whether the existing structure can be brought back to life. It’s a simple equation of which approach makes the most financial sense. But as living organisms, trees can be trickier to evaluate once the smoke clears. 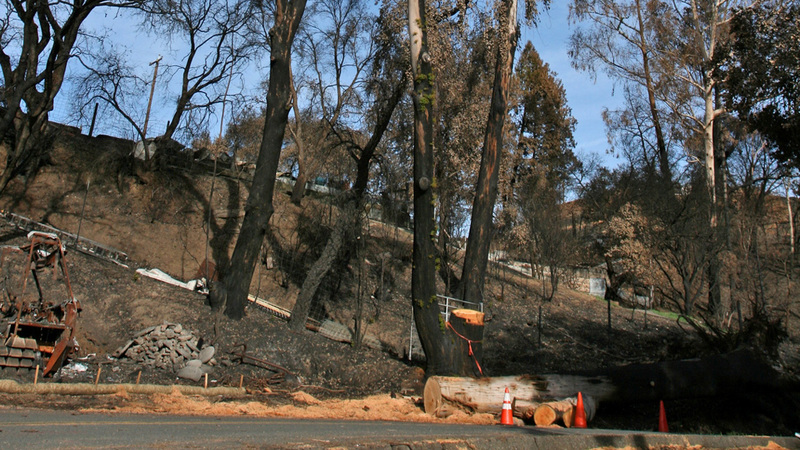 Each species of tree, fire event and property is different, so there is no universal rule to follow, explains Steven Swain, environmental horticulture advisor with the Cooperative Extension of Marin County in California. With the numerous wildfires California has endured in recent years, Swain has had plenty of opportunity to evaluate trees after fires have passed through, and to monitor their conditions in subsequent months and years. When this resprouting from the roots occurs after a fire, it may produce 15 or 20 sprouts; if the goal is to have a tree regrow in that space, the weaker sprouts can be selectively pruned out—but not immediately, Swain cautions: “If you prune them out to a single sprout right away, you’ve once again eliminated almost all of the tree’s canopy, further compromising the root system.” Instead, prune out the unwanted sprouts slowly, over several years, never removing more than about 30 percent of the canopy in any given year, he advises. 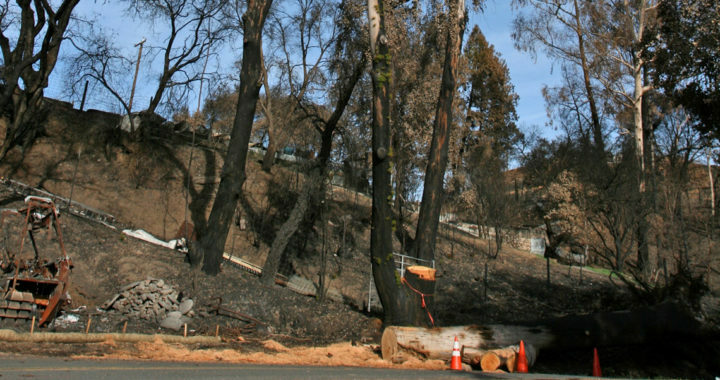 While it’s important to understand that many such trees are “fire-adapted,” meaning they have learned to survive — and even thrive — following natural fire events, it’s also critical to understand that when fires rip through residential areas, the environment is anything but natural. “When fire gets into a built environment, houses and cars with gasoline can burn for hours… fires can burn super intensively — maybe up to 3,000 degrees — for a long time. Even if nearby plants don’t burn themselves, they can essentially be boiled alive from the radiant heat,” Swain says. Clues to look for include trees that still have leaves attached, but with sap coming through splits in the bark and running down the trunks. “Different trees can die in different ways due to fire, and it can be difficult to figure out exactly what happened,” he says. Given all of the devastation that fires leave behind, it’s important to remember all of the reasons why trees are so important, and why it’s worth the effort to save them when possible. In addition to the shade and aesthetic and many other “visible” benefits they offer, “trees, particularly on slopes, help to stabilize the soils,” Swain explains. 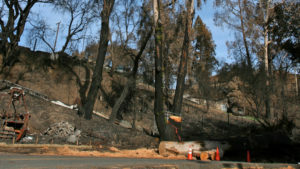 Again, California has seen its share of landslides, which can be a particular concern following a fire, when the landscape has been wiped clean of trees and other substantial vegetation. “The survival of trees is critical in assessing what kind of erosion potential there may be,” Swain says. It’s the kind of thing that hydrologists and soil scientists are concerned about, but that homeowners might not always think of, he notes, so a tree care expert may need to explain the ramifications of removing versus trying to save trees on sloped properties. Of course, if the weakened tree itself poses a hazard — maybe it’s beside a road or structure — it should be removed, adds Swain. “In those instances, you may decide that you want to leave the roots in place, because they’re still anchoring the soil,” he explains. In some cases, a hydrologist may need to be called in to assess the stability of the soil due to the loss of tree roots. Stability and safety of the trees on your customer’s properties are just as important as the aesthetics that they provide. It’s up to you as a tree service provider to inform your clients of the status of their trees in terms of health and longevity as well as the immediate, short term needs that may be of immediate concern. Defects are usually spotted through inspection by an arborist. Or sometimes during a customer call when the customer mentions that “My tree looks kinda funny, is that a problem?” However, those types of inquiries are usually reserved for older trees or ones in close proximity to their house, building or other important structure. In their defense, it’s unrealistic to expect any other routine. After all, it’s the rare individual that can spot a cavity in their tooth, let alone the need for a bridge. The dentist and/or dental hygienist is the professional that is responsible for noticing these concerns, similar to an arborist noticing serious maladies in trees. To provide responsible tree care and provide for the bottom line, it’s good practice to implement a yearly inspection or better yet a continuous monitoring plan (as in dental care) and charge for it — the dentist does, so should you. Explain that yearly inspections will spot problems before they get too bad, and can usually be corrected or at least major damage to surrounding structures can be prevented. All tree flaws are serious, but some more so than others. Generally speaking, there are two groups of defects in trees, the serious and the concerning. Perhaps the most serious are cracks, leaners and decay. Cracks, the physical separation of bark, sapwood and cambium, are troublesome in both a structural and water conductive sense. As well, the separation and opening in the outer tissues allows entrance of disease organisms and insects to the inner tissues, which is almost always a negative outcome in years to come. Leaning trees are much like cracks, except that the separation has occurred underground instead of on the trunk. Leaners are trees whose roots have loosened and lost connection to the soil particles around them. If you spot a tree that is more than 15-20 degrees off vertical, consider it an immediate problem, only correctable with removal. A tree that is 5-10 degrees off vertical is one that is to be documented and monitored for greater lean in the future. A caveat with leaning trees: Some leaners are simply stretching for the light. If there are trees with a building or other object nearby that block the tree from being fully exposed to sunlight, the canopy may have simply reoriented itself in that direction. This is a tree to be monitored, documented and the results communicated with the property owner. Decay is the result of pathogenic fungi activity, working to soften tree tissues, causing loss in structural capacity. There are many specific pathogens such as white rot and brown rot, but all produce the same results. Decay is often hidden by intact bark, necessitating inspection by an experienced tree worker to spot it. Sounding, drilling and simple probing are techniques that can be helpful in this regard. In addition to the loss of integrity in the short term, the seriousness of the malady is that there is no way to lessen the effects in the long term, other than to notify the customer of the seriousness of the defect. Included bark, co-dominant leaders and girdling roots are worrisome, but are usually not an immediate threat to tree failure — more so over time. All can lead to the greater, more immediately concerning problems described above, but are just as important to document and communicate to the client. Root plate issues, surface rooting, roots cut in utility repair, compacted soils, overwatering and other damaging influences are also of certain negative influence and should be noted in monitoring reports, especially when targets of importance are present. Cracks weaken trunks and branches, causing immediate structural concern.